From 1631 to the present, Old Orchard Beach has had a singularly rich history among New England's summer communities. Old Orchard was originally a small seacoast farming community nestled on the shore of Saco Bay. When the railroad came in 1873, the coast exploded into one of the grandest Victorian settings in Maine. It boasted famous religious camp meetings, transatlantic flights, big bands, big fires, harness racing, and automobile racing on the beach. The Kennedy family, Bette Davis, Fred Allen, Rosa and Carmen Ponselle, Pierre Trudeau, and Charles Lindbergh all rejuvenated themselves in this community. 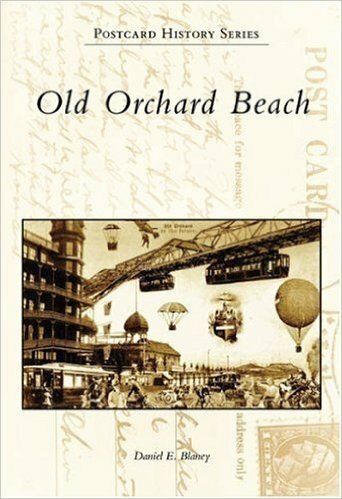 Old Orchard Beach is still a vacation mecca, and residents and visitors alike will find enjoyment and education within these pages. Daniel E. Blaney was born in Old Orchard Beach and still lives in the house he was born in. He has been a member of the Old Orchard Beach Historical Society since 1970 and has served as its president, vice president, trustee, and historian. This selection of postcards comes from his immense personal collection.